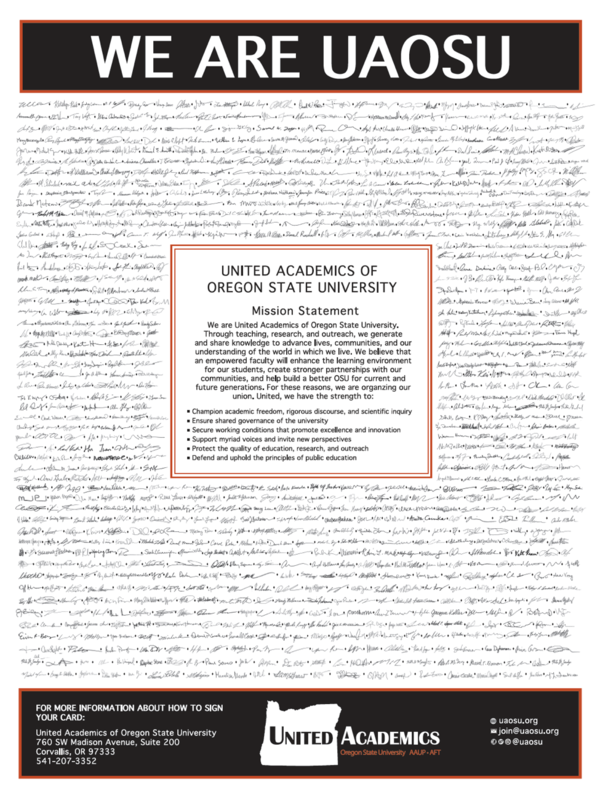 Join a UAOSU Bargaining Work Group! Now that UAOSU is certified, it’s time to prepare for contract bargaining. That preparation starts with forming research groups and conducting an inclusive, university-wide survey about our working conditions. Your input and energy through these groups will ensure that bargaining conversations are focused on key issues. These groups will research a variety of topics, including but not limited to: site-specific conditions, workload, research support, academic freedom, compensation, benefits, and promotion & tenure. The work of the research groups is a crucial first step in collecting information from colleagues about bargaining priorities. If you are interested in joining a work group or have any questions about the process, please send an email to join@uaosu.org or call 541-368-5345. Your time and experience will build a strong foundation for our union and make OSU a better university for everyone.